click HERE for my Creative Inspirations Paints post. 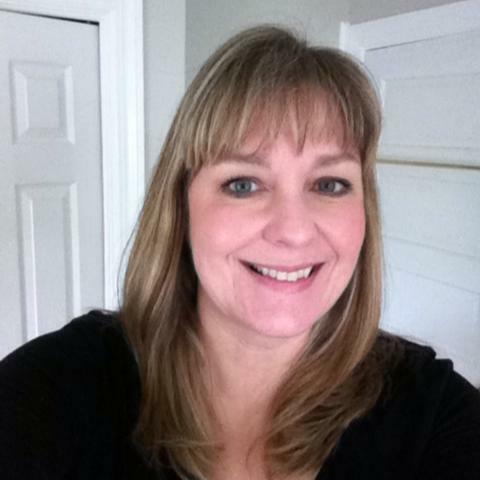 I received a lovely message earlier this week from Denise (aka resqbarbie), the Splitcoast Clean and Simple Challenge Hostess. The CAS team is spotlighting some past Guest Designers (early in my blogging days, I was a GD), and chose one of my cards for its sketch as this week's challenge. I am so honored! I've seen some marvelous takes on that sketch in the gallery. One player's card won over at Moxie Fab World in the Card Design Handbook Focal Point challenge! I used two scraps from the big ol' scrap box, a bit of punching to dress them up, and a butterfly sticker. 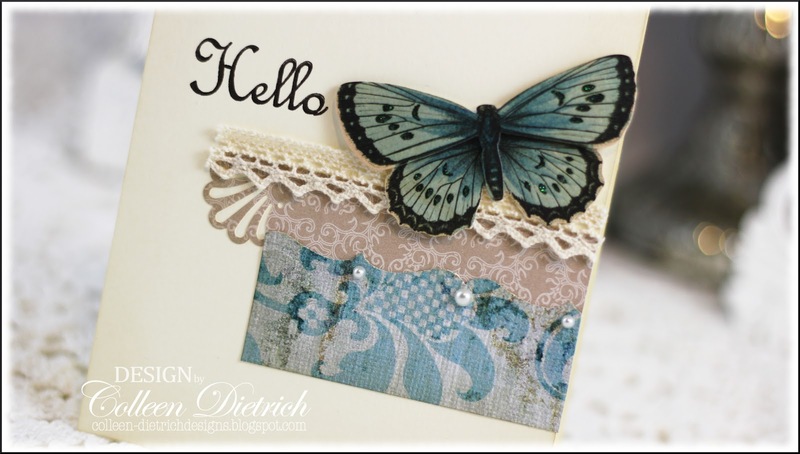 The sentiment and lace are from Inspired By Stamping. Thanks for dropping in, and enjoy your day! Colleen this is marvelous girl! Love the snippets of leftover this and that paired up with the pretty butterfly sticker. Love it! Great layout and a wonderful CAS card! A wonderful CAS card and such a gorgeous butterfly. It's nice to get to case yourself. Nice simple card, I love the card design and "Hello" written on it. Another gorgeous card, Colleen - I do love your style! This is sooooooooo beautiful!! I love love love the butterfly and the lace!!!! WOW, Colleen! This card is simply gorgeous with such beatiful details! Congrats on being featured at SCS! Gorgeous card! Delightful Colleen, I particularly like the corner punch supporting the lace... like the end of a shelf, then the damask reminds me of wallpaper and what a beautiful butterfly sticker, I would probably have a hard time giving it up. 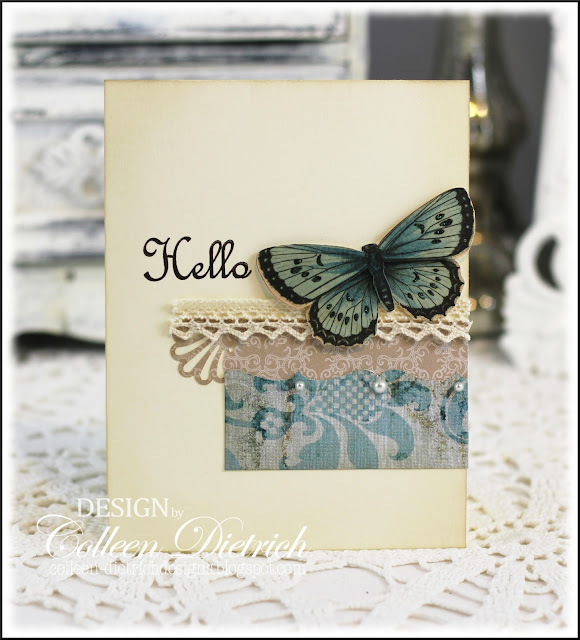 Gorgeous CAS card with beautiful butterfly! Big congrats on being featured at SCS! 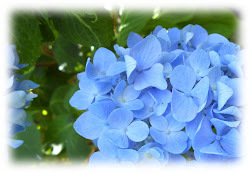 Have a great weekend, hugs! Wow, Colleen! That butterfly just looks so real! AMAZING CAS card!